A fun wedding fair in Bedford unlike any other, lets party! 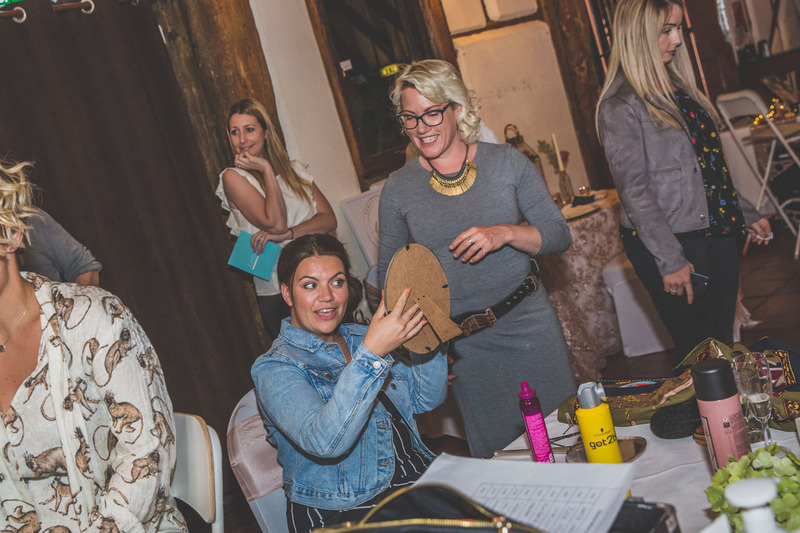 Last month we attended Engage Weddings wedding planning party at The Barns Hotel in Bedford. 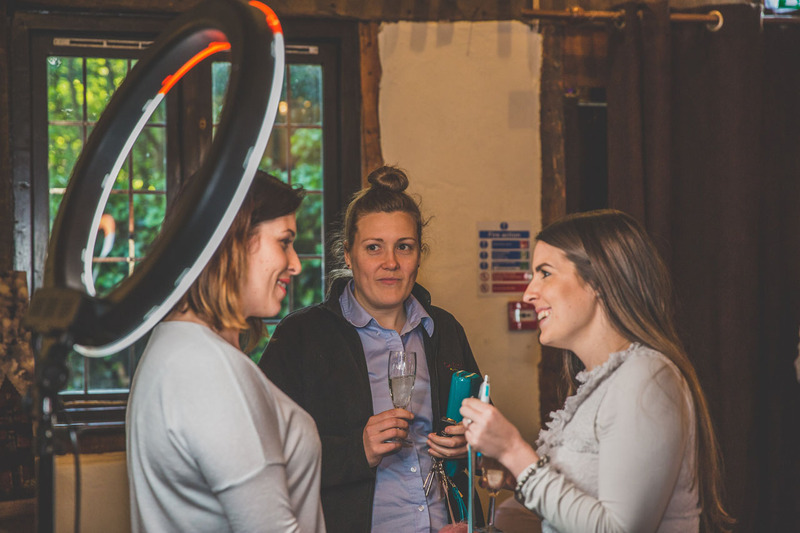 After the success of the first wedding planning party at Coltsfoot Country Retreat last year, we jumped at the chance to be involved again. The real focus of the party is for guests to enjoy themselves whilst trying out what each supplier has to offer. No awkward sales pitches – just lots of fun! 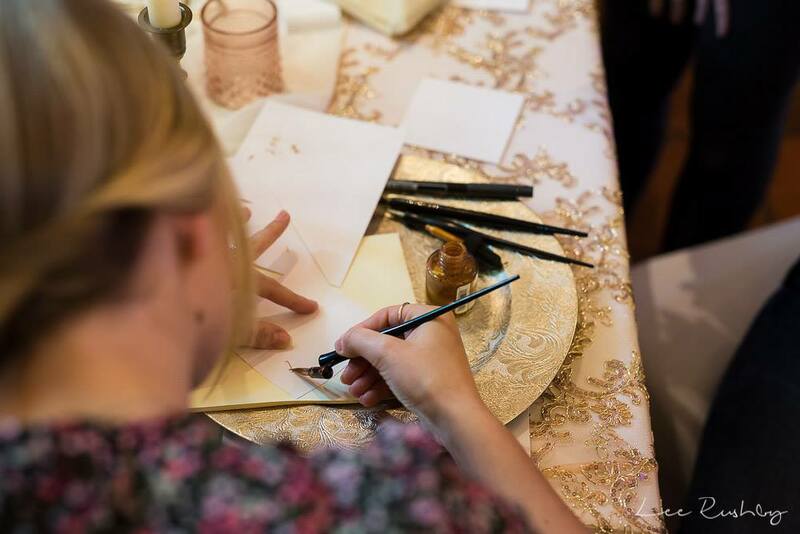 Sara had lots of gorgeous decorations on display as well as well as calligraphy pens so guests could try writing their own invitations and name cards! Sara definitely makes it look easy but wow it’s not easy at all. Sara’s venue styling is sophisticated and elegant. 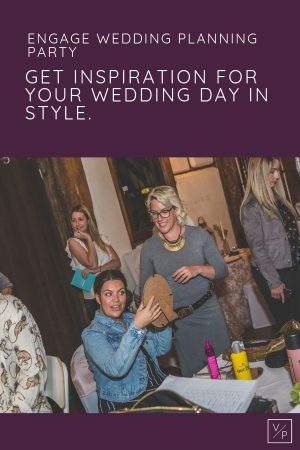 Talk to her about her unique ideas for decorating your venue or incorporating a theme into your wedding day. Shelly from La Belle Wedding Cake Company created a masterpiece prediction of what the royal wedding cake might be like. It looked fabulous on display at the party and guests could taste samples too. Not a fan of cake? How about cookies and popcorn instead! Stardust Events are perfect suppliers for those of you with a sweet tooth. Cookies, popcorn and shot glasses full of sweets are just some of the goodies they can supply for your wedding day. Lee Rushby‘s photographs definitely have the wow-factor. If you’re looking for stunning wedding photographs that impress then talk to Lee! His albums were on display and Lee also took some gorgeous photos of the party too. Sophie from SA Floristry showcased the most gorgeous bouquets which filled the room with such lovely fragrances. Couples could smell and handle the flowers to really get an idea of the quality of the arrangements. 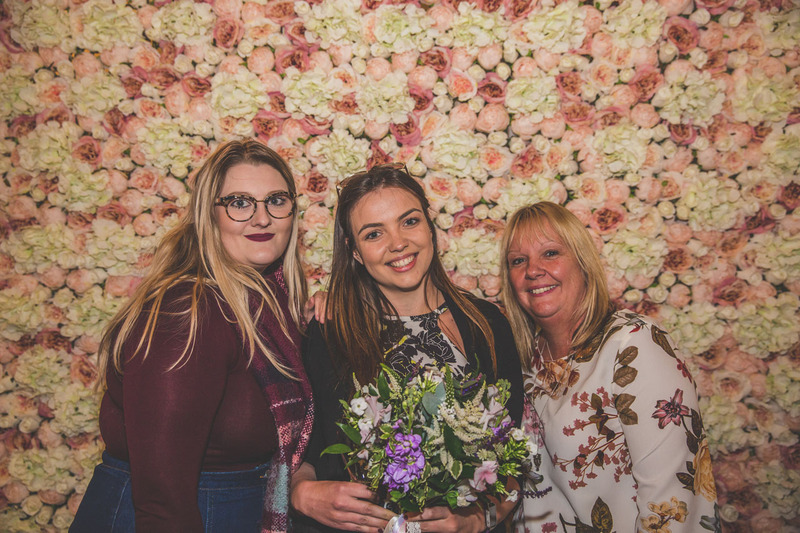 The flower wall from Bella Occasions makes the perfect backdrop for photographs. A fun alternative to the traditional photobooth; guests at the party could have their photo taken by Nicki Shea (one of the most fun wedding photographers we know!) against the wall with Sophie’s gorgeous bouquets. Definitely helps imagining what the day will be like! It wouldn’t be a party if there wasn’t music! Dan from JN Sounds brought the barns alive with epic music of all genres. Guests were in with a chance to win a bottle of prosecco if they correctly guessed how many songs were on Dan’s harddrive. It was great fun watching everyone guess, totals ranged from 15000 – 850000! The correct guess was 40000 and Dan pointed out that Jon also had a harddrive with about 20000 songs on so they can definitely accommodate for your wedding DJ set! Brilliant evening, sooo much more fun than a normal wedding fair. Wedding planning parties are the way forward! Bluemark Entertainment are the team to choose if you’re looking for the whole package. The light up love letters are so good for creating a gorgeous atmosphere. From a videography point of view they really help create beautiful shots during the first dance (we are fans!). We also love a photobooth as it makes for absolute gold video footage of your guests – all of the laughs and silliness! Mark’s photobooth prints photos immediately for your guests to take away with them on the night. The wedding planning party is all about being interactive and trying things out. What’s a better way of finding out if you like a hair and makeup artist than trying out their styles?! Ali Kynoch is the ultimate perfectionist and will make sure your make up looks stunning on your wedding day. I enjoy chatting to brides in a relaxed, friendly, laid back setting about their ideas on how they would like their bridal makeup. 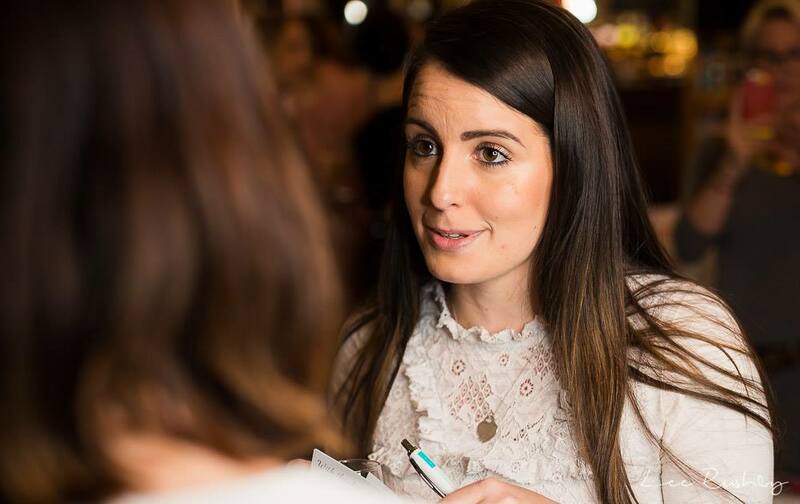 Emma Morris has a wealth of experience – previously working as a freelance make-up artist for London Fashion Week and various television shows. She prides herself on using quality make up for your special day. The team at La Powder Box are fabulous with over 50 5* Facebook reviews their reputation speaks for itself. On the night they offered skin consultations and advice for the lead up to the wedding. Becks from Thairapy creates some wonderful hair styles and is a lot of fun! We met at an Engage networking event before the party and laughed and laughed. If you’re looking for a super professional who will be fun to be around the morning of your wedding, Becks is your girl! Ok so we will let you into a secret that we knew about the surprise ahead of the evening so that we could film them! 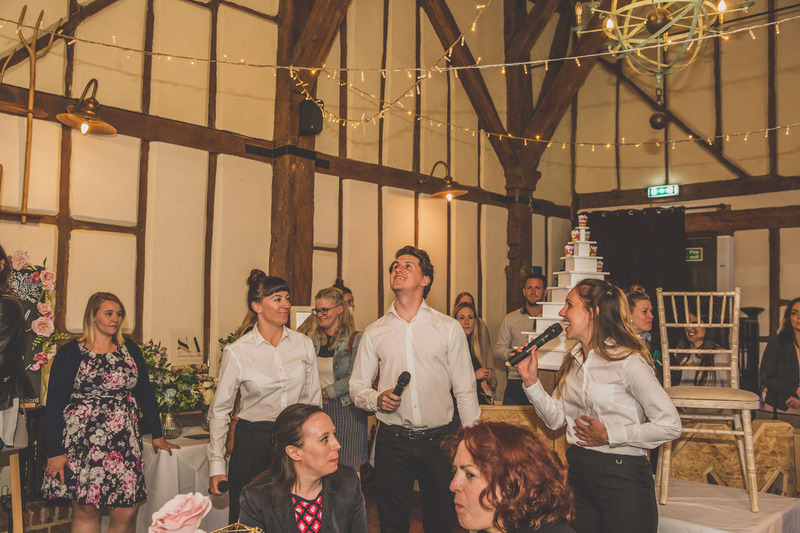 We have filmed singing waiters at weddings before and they always add such fun to the wedding breakfast. The team from Zing Entertainment have an amazing talent and used to sing on the West End Stage! One of my favourite afternoon entertainers at a wedding is a magician. I mean seriously, how do they do it?! Filming guest reactions to the amazing magic is so fun and brilliant to watch back after the day when you were busy having photos taken and chatting to people. Steve Dean has an incredible talent (watch the video above for just a few of the brilliant reactions to his magic!) and it was so much fun filming him wow people at the party. So this was our fun for the evening! Goosebumps guaranteed you hear us declare…well we put it to the test! Guests watched a short clip of one of our weddings and we watched to see if they got goosebumps. The best reactions won some popcorn – the perfect accompaniment to our films. We wanted to show you that wedding films aren’t just about the vows and the speeches. It’s reliving moments that bring back the emotion of the day and watching moments you may not have even seen on the day itself. A big thank you to Bluemark Entertainment for lending us their TV on a stand too! 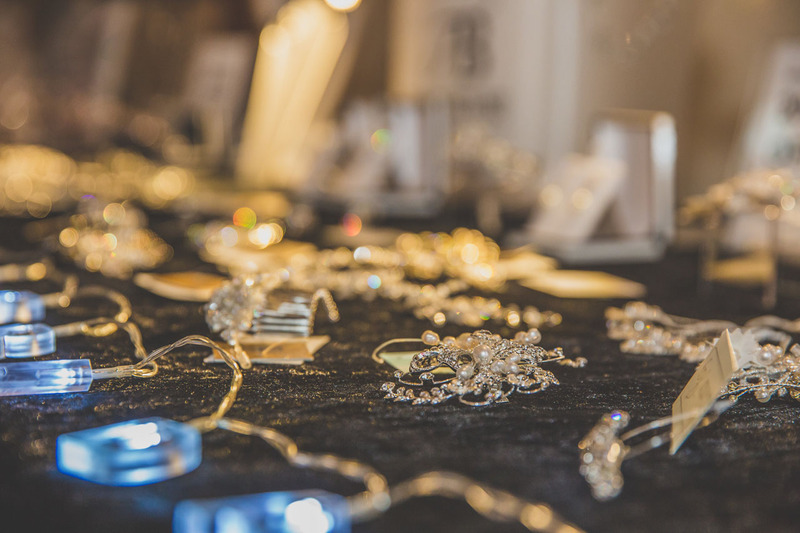 Alison from Townhouse Bridal has such a passion for providing beautiful gowns and bridal accessories at great value. Accompanied by the lovely Sheridan from Sheridan’s Alterations everyone could try out the accessories and make an appointment to try on the beautiful dresses. A huge thank you to Becca from Engage Weddings for organising such another unique and fun event. It was a privilege to be part of the Q&A panel and share advice with you all. We hope it inspired lots of local couples! If you want to attend the next wedding planning party – wedding fair in Bedford then check ticket availability and like the Engage Weddings Facebook page for all the details. Getting married in Bedfordshire? Contact me below, I’d love to capture your special day.